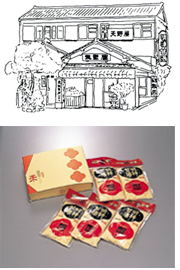 Amanoya was established in 1846 toward the end of the Edo Period. In ancient China it was customary to exchange cups of rice wine or sake at political gatherings. But there was one very talented, high-ranking official who was unable to drink any form of alcohol, so the military commander had a non-alcoholic rice beverage prepared for him–that is to say, “amazake” or sweet sake. In ancient days sake was served without the dregs removed, and sweet sake had the same cloudy appearance. Subsequently sweet sake was introduced to Japan where it became a popular substitute for difficult-to-obtain sugar. In the Edo period it served as a non-alcoholic health drink and popular beverage. Even today it retains a reputation as being good for the health and promoting a beautiful complexion. Amanoya sweet sake is prepared from a traditional recipe using only rice and a fermenting agent, with no chemical additives whatsoever.